Jason Kravitz (Brussels, Belgium) on 12 February 2008 in Animal & Insect and Portfolio. 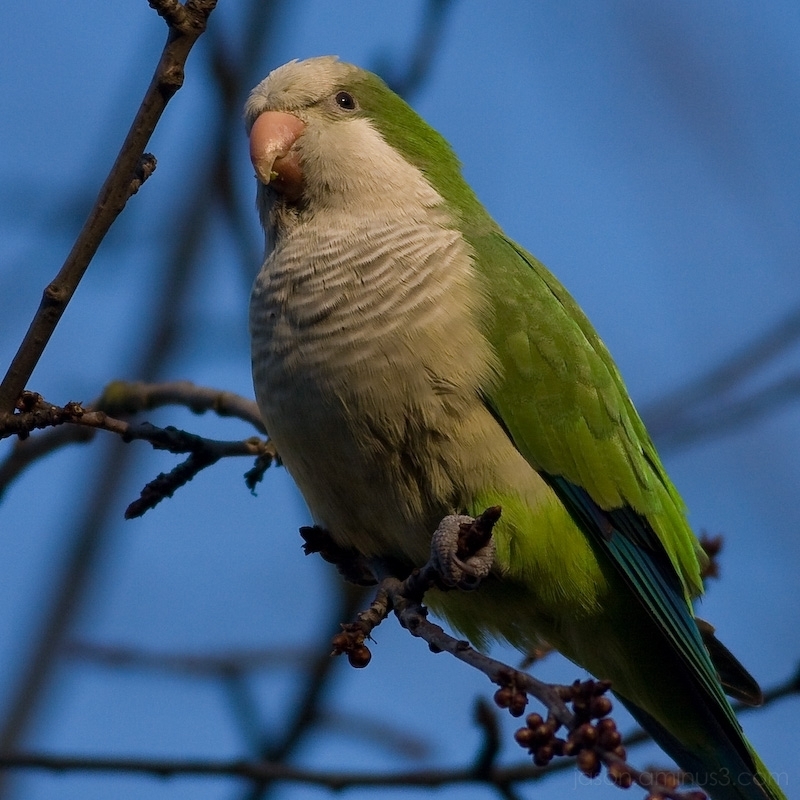 They say they started from a single pair and now there are hundreds of wild Monk Parakeets flying around Brussels. They are fairly big too and make lots of noise. Glad their nests are close to my house but not too close! A Quaker parrot (a/k/a Monk Parakeets) Excellent clarity and detail Jason. His pose is perfect for you to take the shot. I enjoyed your caption about them invading Brussels. This is interesting as they have done the same in the U.S. Story is a flight came in from South America and they got loose at Kennedy Airport in N.Y. many years ago. There are large colonies of Quakers in the North East area of U.S. but here in Florida, in the south we have colonies everywhere. They are known to be the best nest builders with 3 rooms to their nest, one being the nursery. They are also sold as pets from breeders and pet shops. They are against the law to have in California and some other states. I have also had one for a pet named Quaker (what else) for 20 years now. He is full of personality. When they are together they can be loud. I was so surprised to see you have them as well. They fly over my apartment every morning and the f*ck3r$ are indeed extremely noisy. I know there are nests in Molière and near Vanderkindere/Waterloo. Apparently they survive because winters in the city are pretty warm (espacially close to buildings). Normally their feet would freeze. They have veins in their feet which makes them vulnerable to frost. They've been a plague in London as well. Simply beautiful, and very nice capture at 400mm. I would have liked to see the whole parakeet in the frame, but it's not a big issue. I wish they invade us too. We've never seen such things here where I live. Very nice color! They certainly would give the cardinals, gold finches, and bluejays a run for their money in my part of the world. But I am not aware of any colonies existing in the American midwest. Gorgeous capture!! Great details in this and that green against the blue of the sky is beautiful!! Could it be an invasion due to global climate change? Anytime a non-native species moves in it could be dangerous for the local population. wow. beautiful. great detail and color and dof. how'd you get such a close shot? Well...you are still lucky with just birds! We have recently had crocodiles found on the drainage along the roads in suburban Japan! Yesterday evening in the Parc du Cinquantenaire (Etterbeek/Brussels) we heard at least 60 birds making such noises. They are abundant in the city of Brussels. I haven't seen a nest yet.